Our trip to Los Angeles was well worth it. The King Tut exhibit is amazing. It is hard to believe the wooden items that have survived over 3000 years. There artistry of ancient craftsmen is truly fine. The statues and jewelry are fabulous. There are hundreds of people in the building, but you are not rushed to view anything. You could stay all day if you wished. We took our time and listened to each taped message on the rented headset player. We read every sign and explanation about every item. You cannot take cameras into the exhibit. They made people check their camera cell phones at the entrance before letting them go in. If you want pictures you have to buy the books and CD’s in the gift shop. We only bought two King Tut shot glasses in the gift shop. Long ago I would have loved to make a trip to Egypt and see these wonders where they were created. Due to current world changes and attitudes to American in the middle east, I no longer have any desire visit the pyramids and wonders of the ancient world in that area. I’d love to visit Europe. 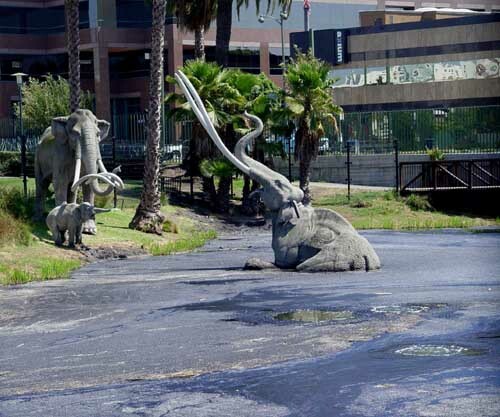 Right next to the King Tut Exhibit is is La Brea Tar Pits. 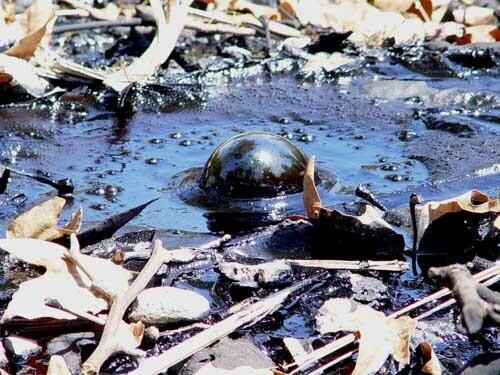 This is an area where tar naturally bubbled to the surface 10,000 years ago and longer. It is still bubbling up today. Ancient animals got stuck in the tar and over the eons, thousands of animal died in the mire of the tar. Today, and since the early 1900’s the tar pits have been excavated for the bones of those unfortunate animals. Saber toothed tigers, giant sloths, dire wolves, mammoths and more. There is a museum right there that displays the assembled bones. We decided that would be a tour for a different day. This full size model Columbian Mammoth is stuck. Predators, after a free meal, may get stuck too. 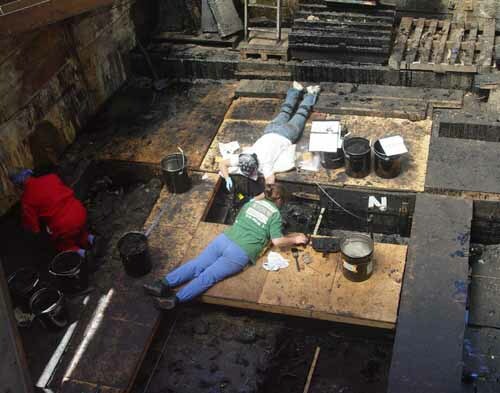 This excavation is at 14 feet going on 15. We could see bones being exposed. Of course we stopped by the ocean for a little while on the way home. It is alway wonderful to sit and watch and listen to the waves crashing on the shore. Gurgling streams, and waterfalls do the same thing for us. Water seems to calm the soul and sooth the mind even if they are still waters. I have a plan. The Bounder needs to be smogged to be registered. I think that calls for a camping trip to the beach. Go first thing in the morning and get it smogged and then continue north to Emma Woods State Beach and camp overnight. Maybe next week would be a good time for that. We have until October 16 to get it smogged, so there is no hurry for smogging. The hurry is going camping.